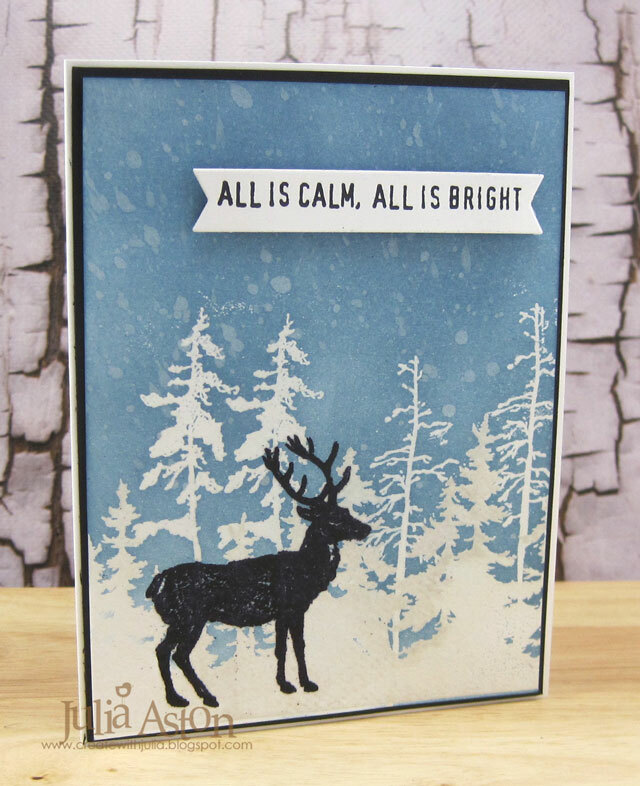 I'm the hostess for this month's A Vintage Journey Challenge - and my challenge is called Star Light, Star Bright. 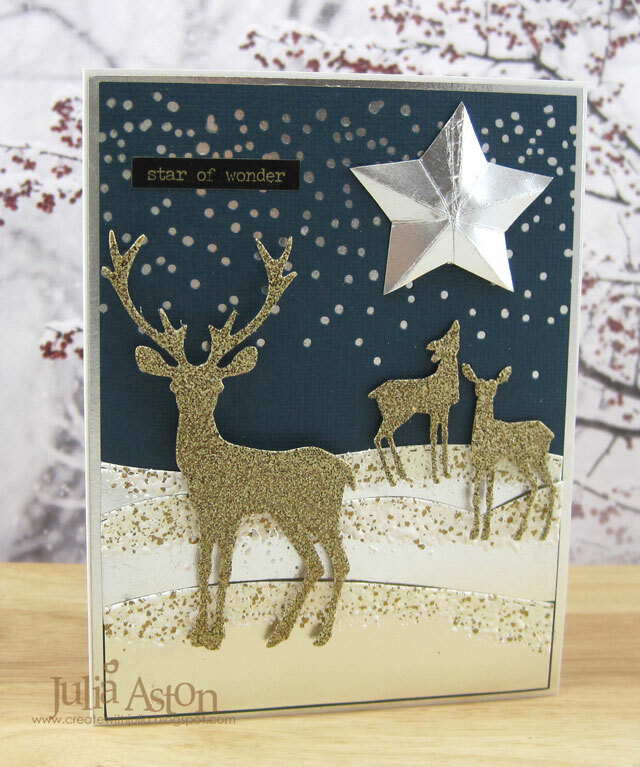 This month we are asking you to to create with stars. Fill up the dark winter sky with them or use one really big one as your central focus. Stencil them, stamp them, emboss them or die cut them. 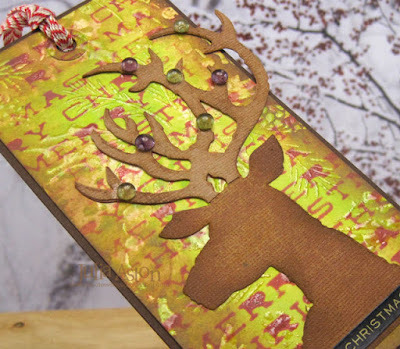 Make a card, make a star box, make a canvas, create a journal page - remembering to create in the vintage, shabby, mixed media, art journaling, industrial or steam punk styles. 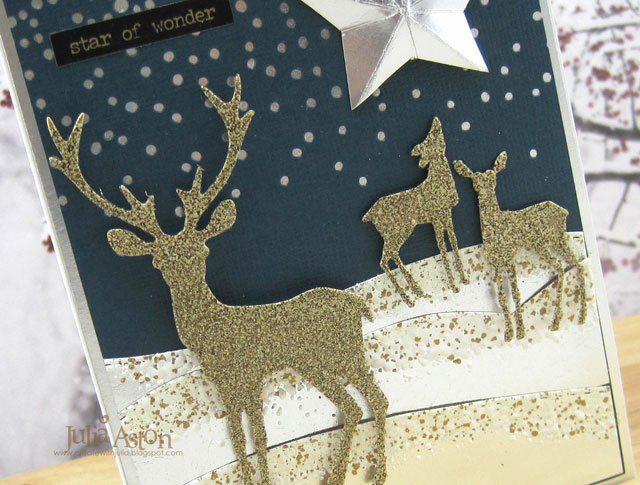 I made a Christmas Card of a starry winters night. 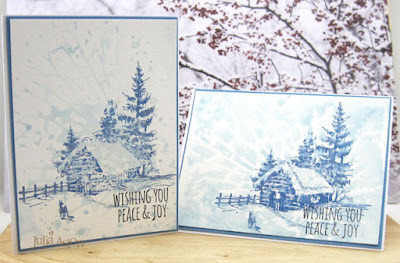 I have a few photos of my card here and will be posting a tutorial over at A Vintage Journey in two weeks. I'm pretty sure you will be inspired by what the Creative Guides have to share today and that you, in turn, will be inspired to create your own Star Light Star Bright project to share with us! 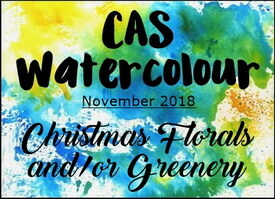 You have until January 3, 2019 at 6 pm Greenwich time to add your link! 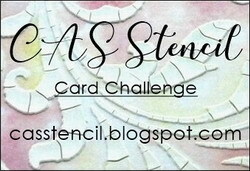 You'll find the challenge, the inspiration and the link here! 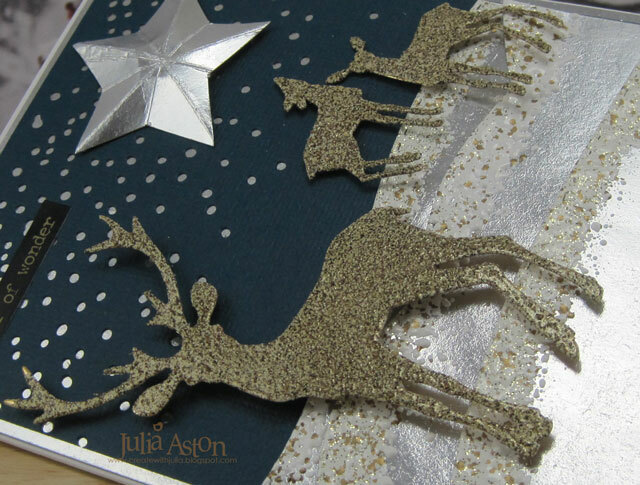 Paper: White - PTI, Silver and Gold Kraft Stock Metallic Paper - Tim Holtz/Idea-ology, Blue Kraft Core-dinations. Accessories: Winter Wonderland Die - Tim Holtz/Sizzix, Stitched Landscape dies - Poppy Stamps, 3D Star - Savvy Dies, heat tool, Dirty Baked Texture Embossing Powder - Emerald Creek, Shabby white Frantage Embossing Powder - Stampendous, Metallic Stickers/Holiday Talk - Tim Holtz/Idea-ology, thick foam dots. Whenever there is a 5th Friday in the month - several of the Creative Guides for A Vintage Journey post a tag - and this month I'm one of those Creative Guides! Since it is now the season, I made a Christmas Tag! 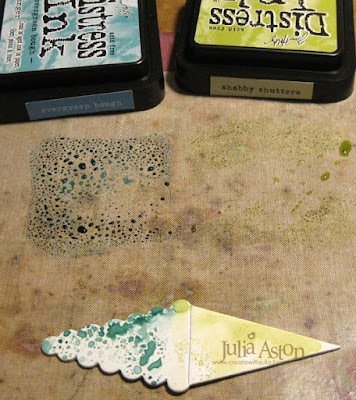 I have a few process photos to show you just how I created my tag. I started with a manila tag 6 1/4" x 3 1/4". 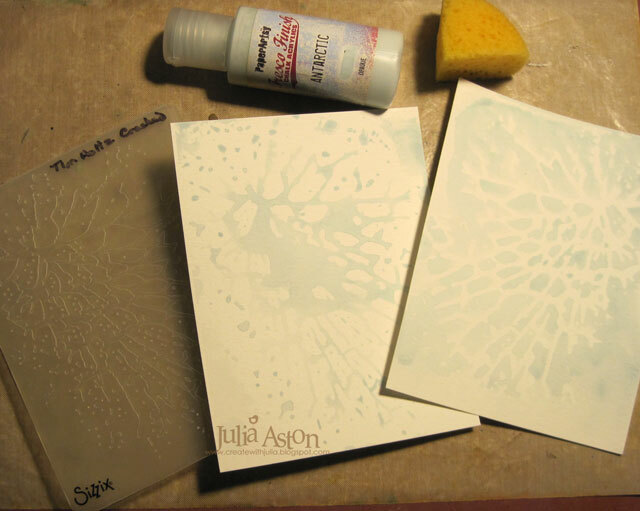 I rubbed Twisted Cintron DOX onto my craft mat, spritzed with water and pressed my tag into it. 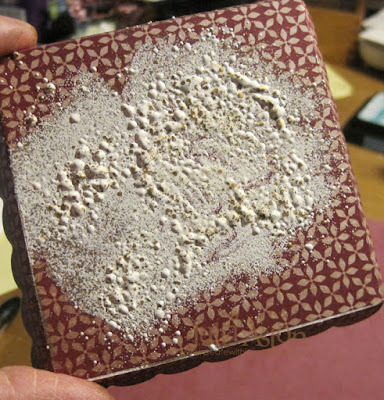 I dried it with my heat tool. 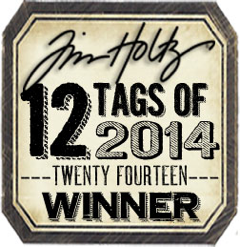 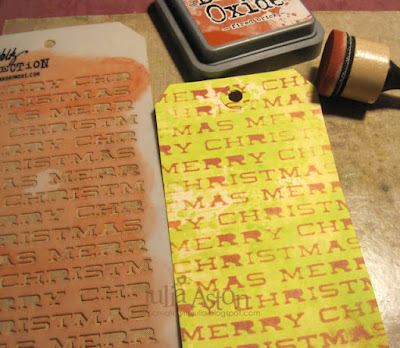 Then I sponged Fired Brick DOX through a Tim Holtz Christmas Stencil onto the tag. 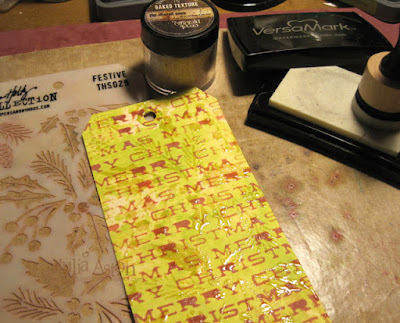 And for a third layer - I sponged Versamark ink through Tim's Festive Stencil and embossed it with Vintage Beeswax Baked Texture. 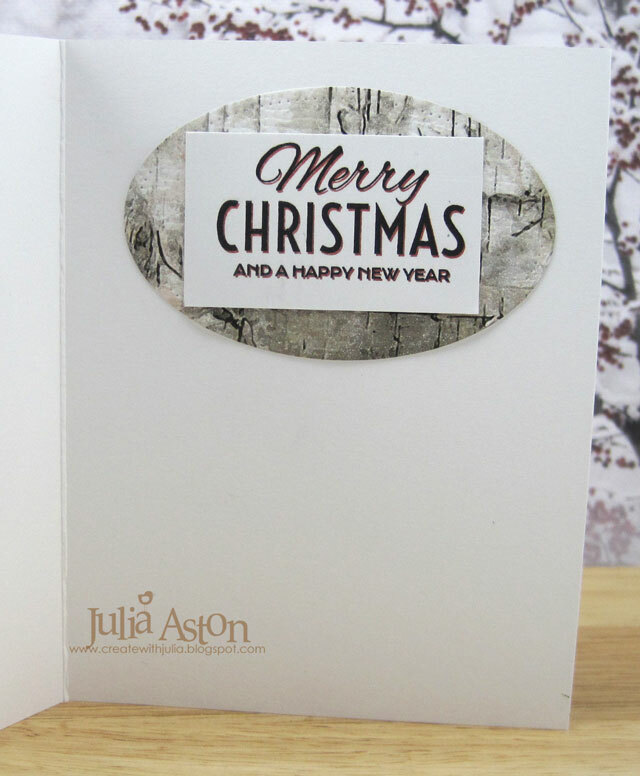 This made a wonderfully shiny almost-clear design over the other layers. 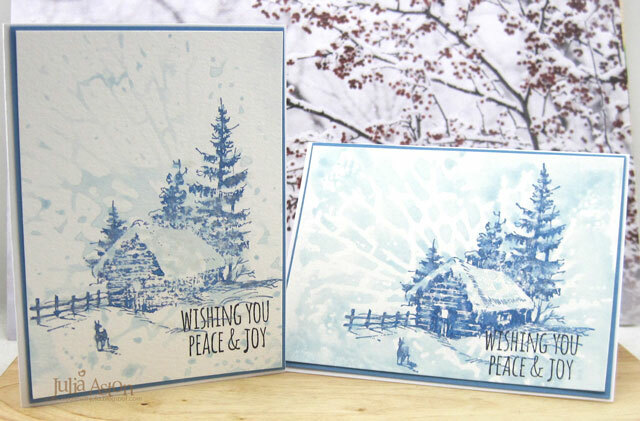 To vintage it up a bit - I sponged around the edges of the tag with Vintage Photo DOX. Then I took out my Dashing Deer die and cut it out of Kraft Core-dinations brown and then just the antlers out of a lighter tan. 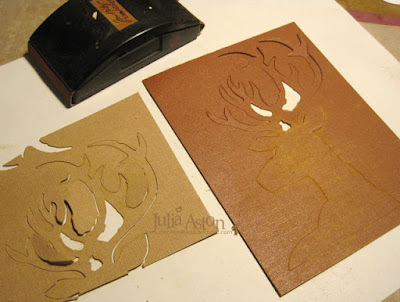 Before removing the cuts from the paper, I sanded over them to reveal some of the Kraft Core. 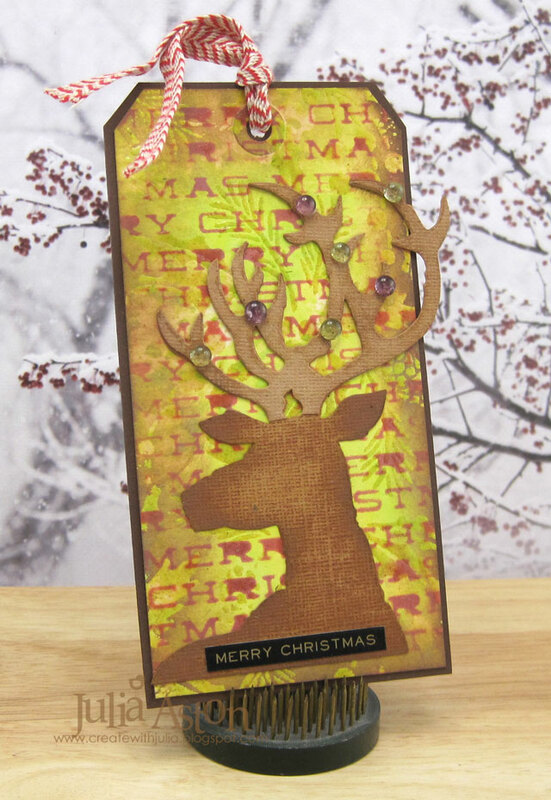 I trimmed the bottom edge of the antlers and adhered them over the brown die cut and then sponged the edges a bit with the Vintage Photo DOX. I adhered the deer to the tag, added some dew drops to his antlers, a Metallic Holiday Sticker and looped a piece of Cream/Red Trimmings through the hole of the tag. 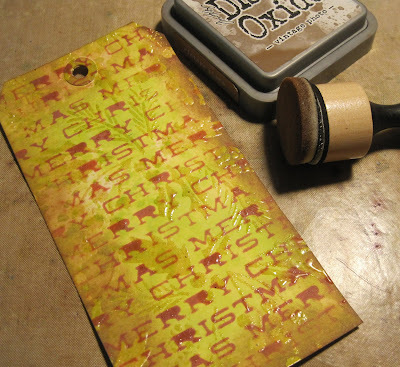 I layered my tag to a slightly larger piece of brown card stock just to give it a more finished look. 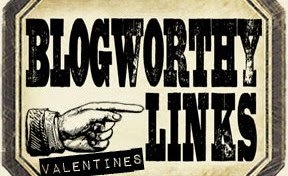 So please take a look at all the wonderful tags created by the Creative Guides over at A Vintage Journey - you can also link up your tag there to share with us! 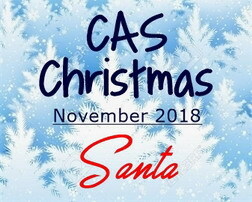 Welcome to this wonderful holiday season! 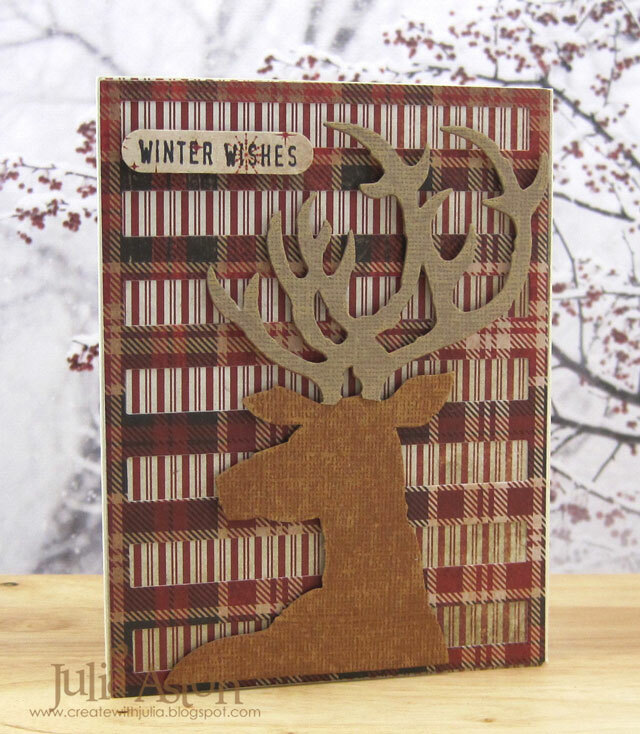 Paper: 6 1/4' x 3 1/4" manila tag - Ranger, Kraft Core-dinations tan and brown, Dark Chocolate - PTI. Ink: Ranger Distress Oxides Twisted Cintron, Fired Brick, Vintage Photo, Versamark. 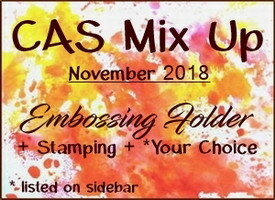 Accessories: Christmas Stencil, Festive Stencil - Tim Holtz/Stampers Anonymous, Dashing Deer Die - Tim Holtz/Sizzix, Vintage Beeswax Baked Texture - Emerald Creek, heat tool, Dew Drops, Tombow Glue, Trimmings/Naturals Red/Cream - Tim Holtz/Idea-ology, mini sander, Metallic Stickers Holiday Talk - Tim Holtz/Idea-ology. 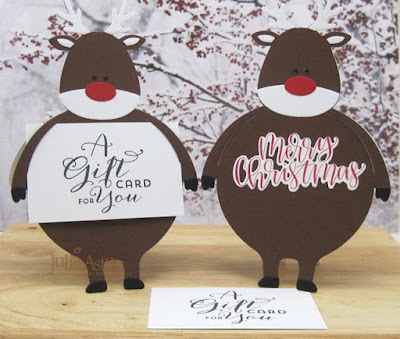 I have two Christmas cards to share today. 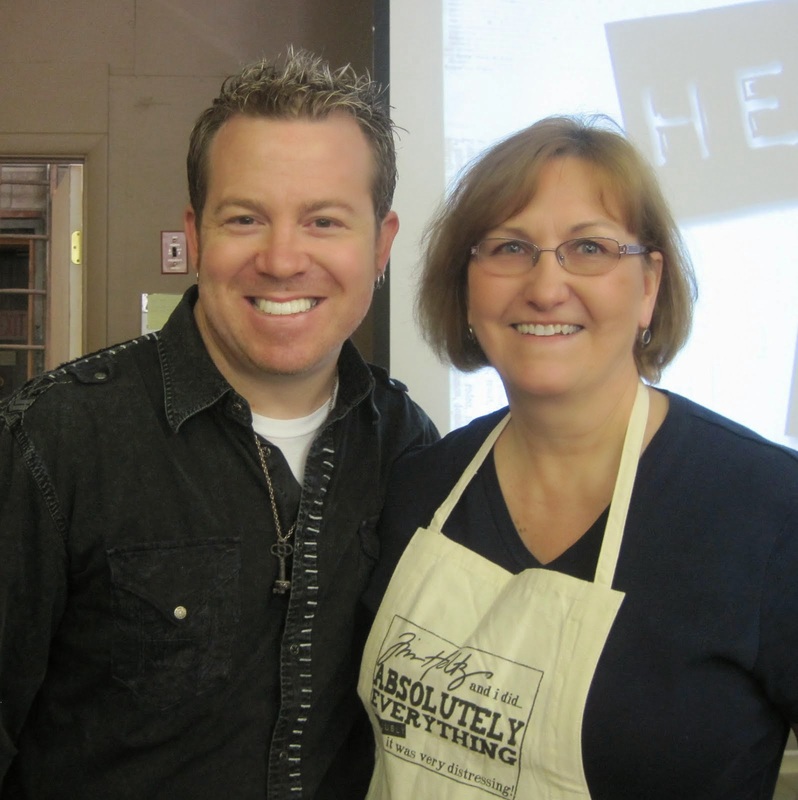 I created my positive and negative backgrounds using Tim Holtz Cracked Embossing Folder. 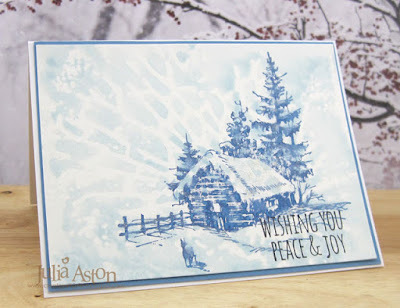 I sponged Antarctic Fresco Finish Chalk Paint over one side of the inside of my embossing folder, spritzed heavily with water and pressed a panel of watercolor paper into it and rubbed over it for a minute or two to be sure the watery ink absorbed into the paper. I removed the panel and washed the EF. I used the same technique on the other side of the EF. I thought the light blue paint made a rather artistic snowy background for my stamping of Tim Holtz Scribble Woodland stamps. 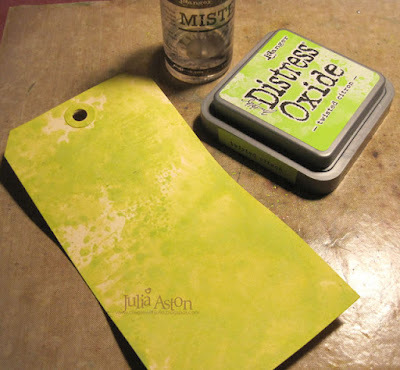 Ink: Hero Hues Black, Ranger Distress Oxide Stormy Sky. Accessories: Cracked Embossing Folder - Tim Holtz/Sizzix, Antarctic Fresco Finish Chalk Paint - Paper Artsy, water Mister, Clear Glitter Wink of Stella. 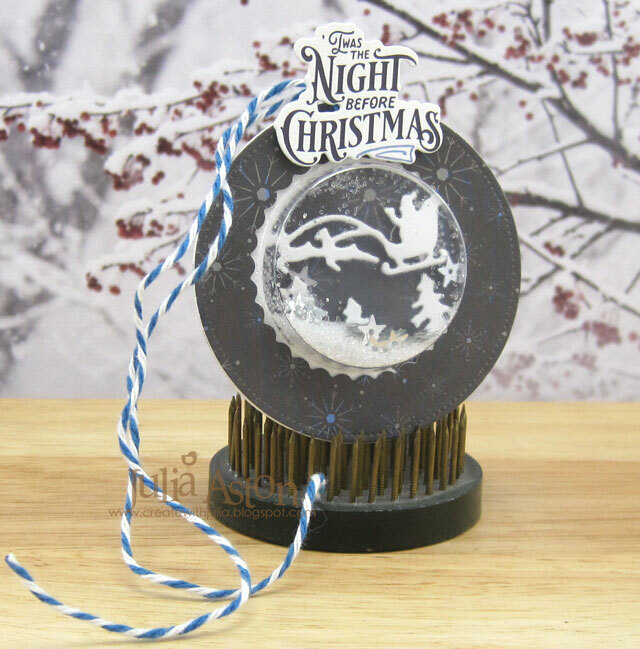 This month members of Eileen Hull's Inspiration Team are creating holiday decorations using a variety of Eileen's Sizzix dies. 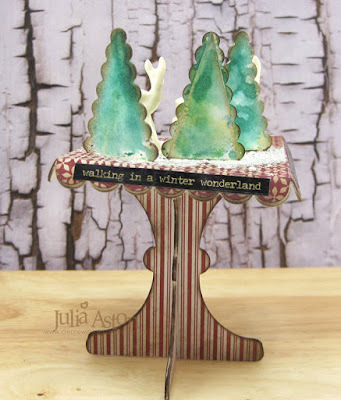 Today, I have a project using her fun Cupcake Stand and Pennant die, using the pennant piece to make trees! 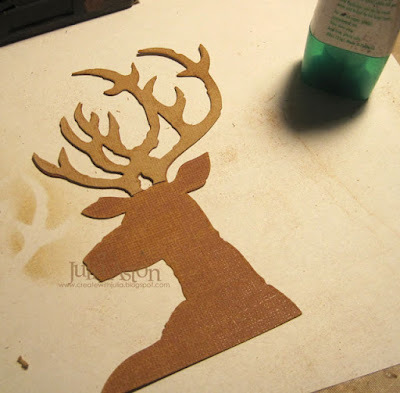 First I cut out all the pieces from Little Sizzles Matboard. Then I cut out pieces from patterned papers to adhere to the matboard. 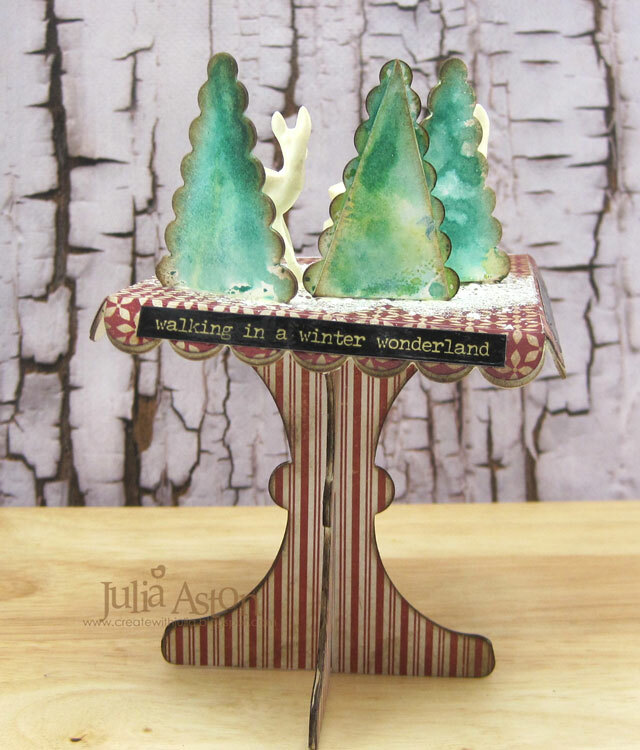 I was thinking I'd use little bottle brush trees for my scene, but then, when I was looking at the pennants they suddenly looked like trees to me! I colored the "trees" by smooshing them onto my craft mat where I had rubbed some Distress Inks (Shabby Shutters and Evergreen Bough) and spritzed them with water. 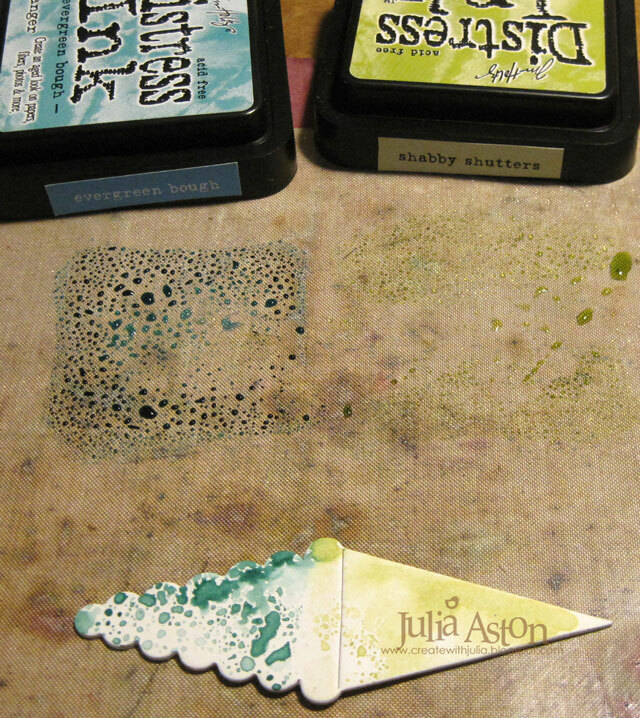 I kept pouncing the "trees" into the inks until I was happy with the coverage. 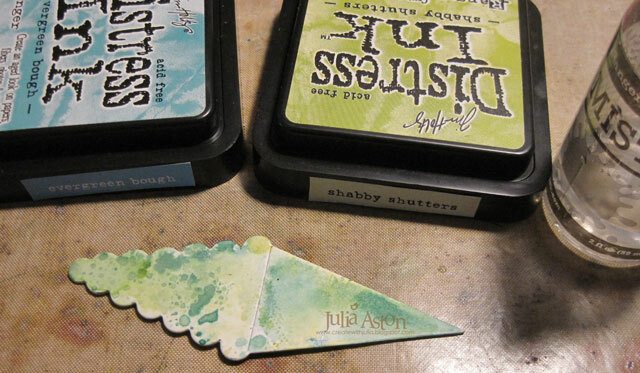 and I inked them on both sides. 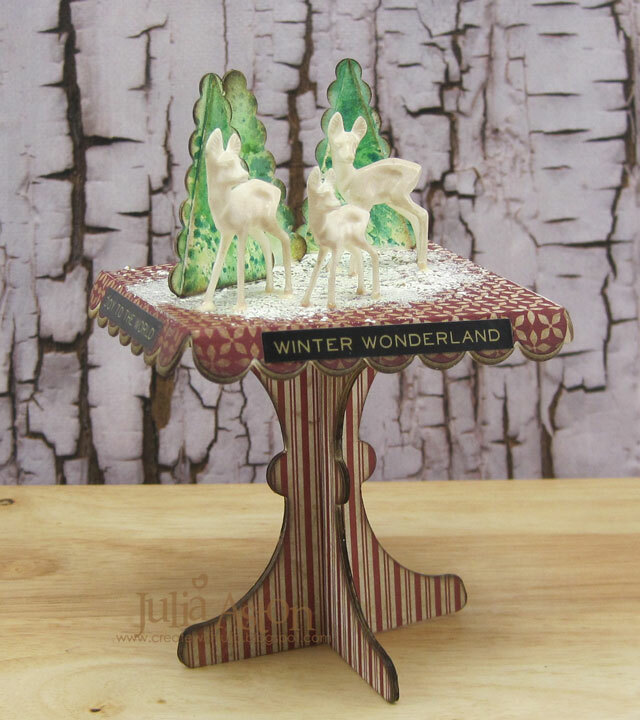 I wanted the top of the stand to look snowy and so I got out my Frantage Shabby White embossing powder. 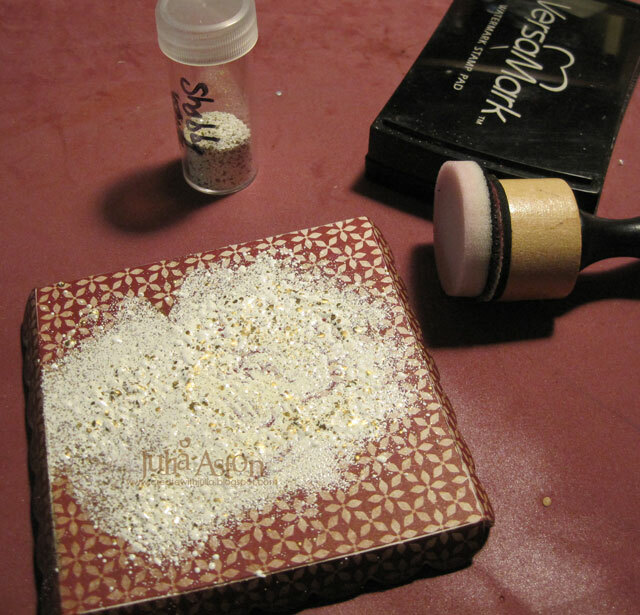 I rubbed Versamark just over a portion of the top using a small round sponge to keep it 'snow like' and not in straight lines, sprinkled on the powder and hit it with my heat tool. I love the lumps and pieces of gold in the Frantage powders. 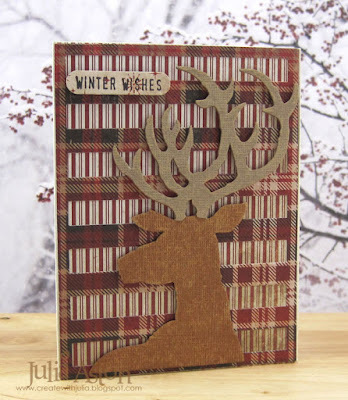 Idea-ology deer to the top. 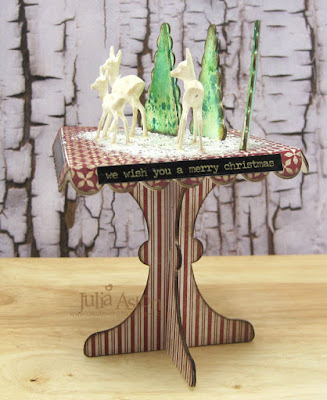 I sponged Walnut Stain Distress Ink over the edges of the trees, the edges of the table and legs as well as rubbing some on the deer. I added a Metallic Stickers/Holiday Talk to each side of the table. 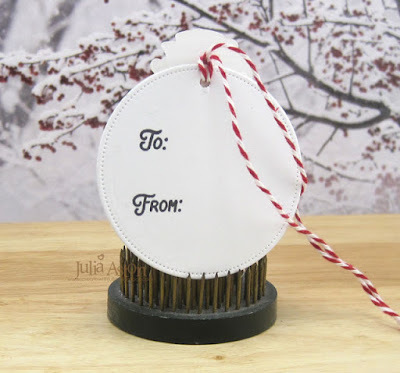 It's fun to see if you can use a die for a different purpose than it was intended for! 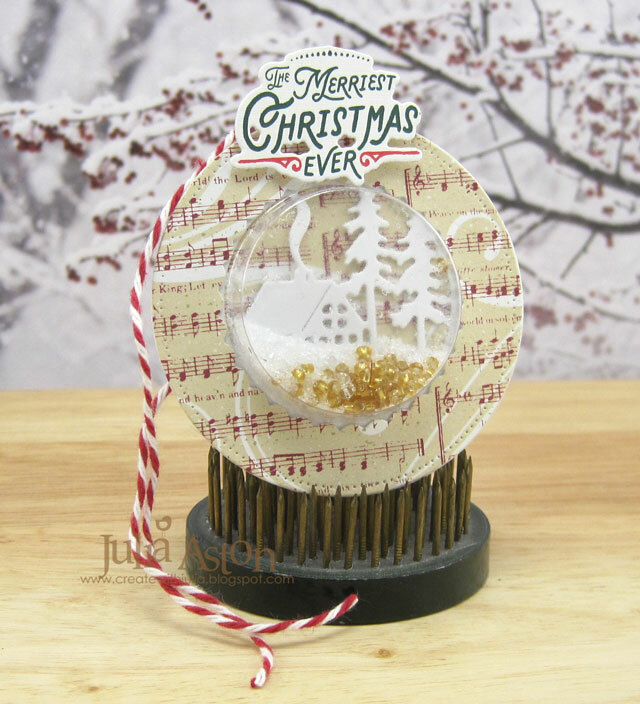 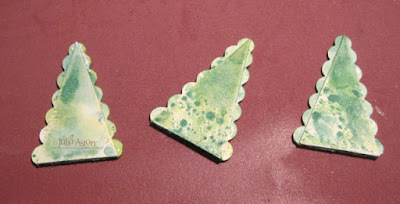 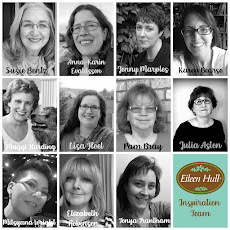 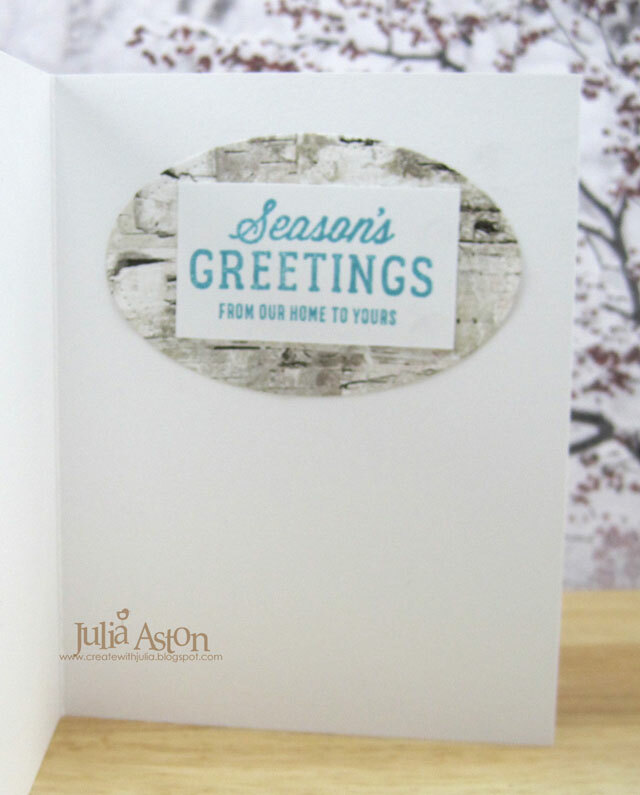 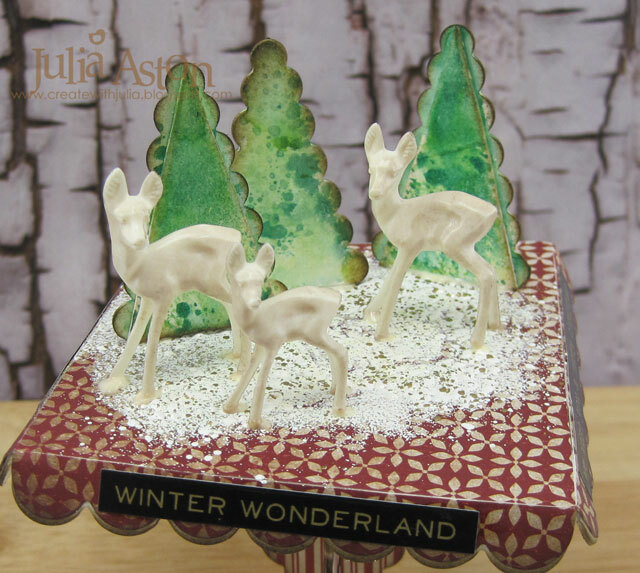 Please check out Eileen's blog all this month for creative ideas for the holidays using her dies! Paper: White Little Sizzles Matboard - Sizzix, Paper Stash/Tidings - Tim Holtz/Idea-ology. 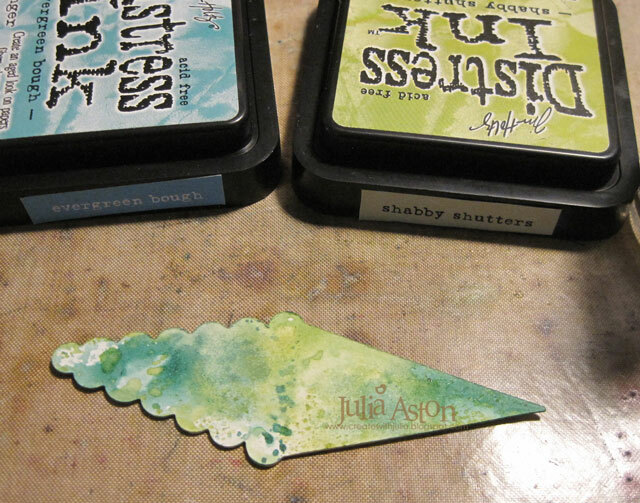 Ink: Ranger Distress Shabby Shutters, Evergreen Bough, Walnut Stain, Versamark. 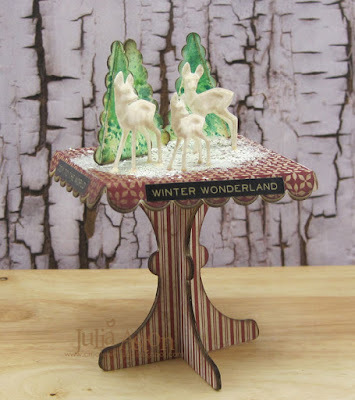 Accessories: Cupcake Stand and Pennant - Eileen Hull/Sizzix, Decorative Deer, Metallic Stickers/Holiday Talk - Idea-ology, heat tool, craft mat, water mister, sponge and sponge applicator - Ranger, Frantage Shabby White Embossing Powder - Stampendous, Tombow Glue.